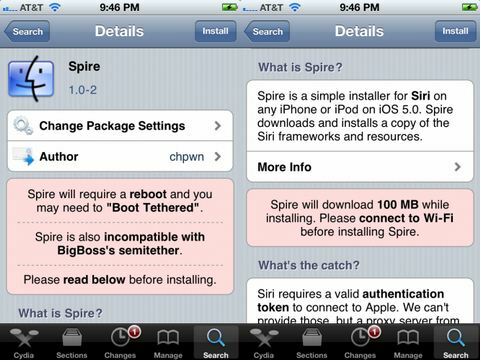 iOS developers/hackers chpwn and Ryan Petrich have released a tool called Spire in Cydia that allows non-iPhone 4S devices to run Siri. Unlike other Siri ports on older iOS devices we’ve seen before, this port doesn’t have any copyright issues with Apple as other ports did. Spire can be downloaded from Cydia on iPhone 4, 3GS, iPod touch 3rd/4G, and iPad 1 running iOS 5 or newer. Spire is a small file when you download it from Cydia, so it will download fast. After you download Spire from Cydia, Siri will directly be downloaded on your device directly from Apple, which will be 100 MB of data so it recommended by the dev to be connected to a WiFi network while doing this. It’s not easy as you might think. After you download Spire and the Siri files, you still going to need a Siri authorization to connect to Apple’s server. You can either use your or your friends’s iPhone 4S authorization. And set up a proxy.